What is DNSLockington.exe? Should I remove it? What should you know about DNSLockington.exe file? 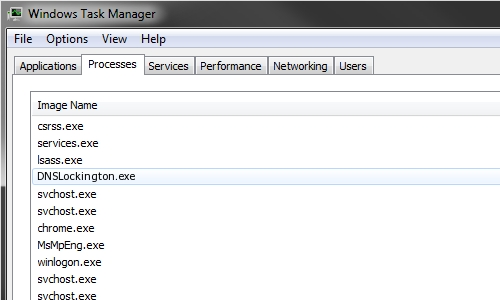 How did DNSLockington.exe sneak into my computer system? What to do if DNSLockington.exe process is already running on my computer? DNSLockington.exe file is one of DNS Unlocker’s components. DNS Unlocker is an infamous ad-supported computer parasite, which creates and displays unstoppable ads each time computer user browses the Internet. Therefore, DNSLockington.exe program is a complicated piece of software that develops these ads. At the first sight, it seems that ads by DNS Unlocker are useful, as they usually provide great money-saving deals, price comparisons, and other offers that seem to be helpful when shopping online. Unfortunately, these ads are created in a particular way, which forces computer users visit predetermined web sources when they click on them. It goes without saying that computer users are annoyed to experience continuous redirects, so that is why they start looking for information about these ads and where do they come from. You should not click on advertisements powered by DNSLockington.exe as they can lead you to high-risk web pages that might be filled with questionable or even harmful content. Be aware of the fact that such websites usually look trustworthy – this might encourage you to install the content they provide. Generally, you should stay away from ads marked as “Brought to you by…,” “Ads by…” or “Powered by…” as they most likely are created by an adware program. As we have already mentioned, clicking on such ads will lead you to shady web sources, and as a result you might contaminate your computer with additional computer parasites. Usually, DNSLockington.exe hijack computers by exploiting people’s carelessness. This process can enter computer system alongside other free programs as it tends to travel in software packs. Inattentive computer users risk installing this process by selecting Default or Standard installation mode; yet, computer security experts advise avoiding these settings as they simply conceal pre-selected agreements to install optional applications alongside the primary program. Users should prefer Custom or Advanced installation settings as these options allow to review software’s components and opt out the ones that are unnecessary. Users should also stay clear of suspicious emails that come from unknown senders. It is advisable not to open such emails at all; they might present malicious links or deliver infectious attachments that can contaminate your computer with adware or other potentially unwanted programs. As we have mentioned, DNSLockington.exe is a complicated program, and you need to have some computing skills to remove it in a right manner. 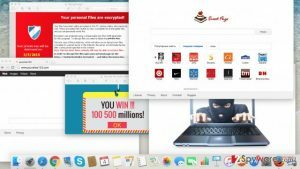 If you wish to take matters into your own hands and remove DNSLockington.exe manually, navigate to this post – How to remove DNS Unlocker virus? (Uninstall Guide) to find a comprehensive DNS Unlocker and DNSLockington.exe removal guide. However, we strongly recommend you to employ a powerful malware removal tool such as Reimage and eliminate this dangerous file automatically. Verduidelijk DNSLockington.exe bestand. Heb ik het nodig? Opisz plik DNSLockington.exe. Czy go potrzebuję? Ho bisogno di DNSLockington.exe file? Define o Ficheiro DNSLockington.exe. Preciso dele? Er DNSLockington.exe en trygg fil? Describe DNSLockington.exe file. Is it necessary? Defineeri DNSLockington.exe fail. Kas ma vajan seda? Vai DNSLockington.exe ir drošs fails? This entry was posted on 2016-03-21 at 04:46 and is filed under Files, Spyware related. You can quickly scan the QR code with your mobile device and have DNSLockington.exe manual removal instructions right in your pocket.